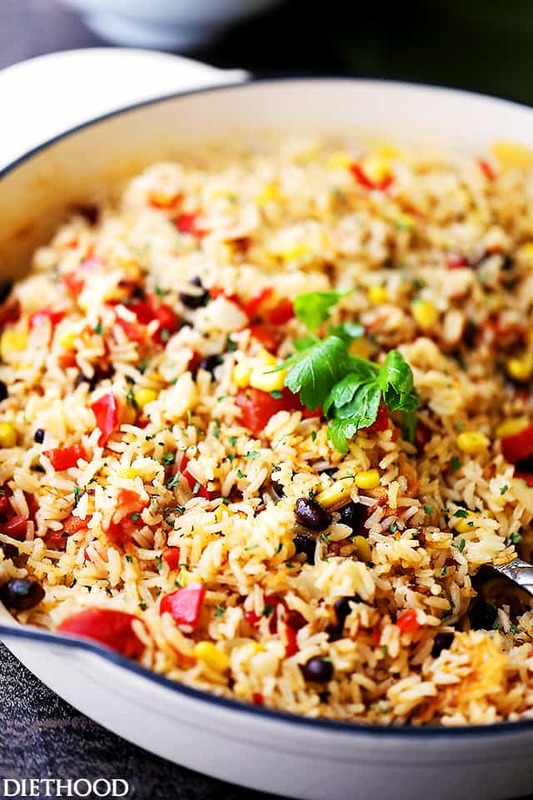 Fiesta Rice Recipe – Mexican inspired side dish recipe with fluffy, tender, flavorful rice and colorful veggies. Serve with Mexican food like, tacos or enchiladas, but it’s just as good served with steak or chicken. Great news: ONE POT + ALL THE INGREDIENTS. Hello Hello! Happy day to you all! Because I’m a big believer in celebrating all holidays, today, the day before Cinco de Mayo, I will present to you THIS. 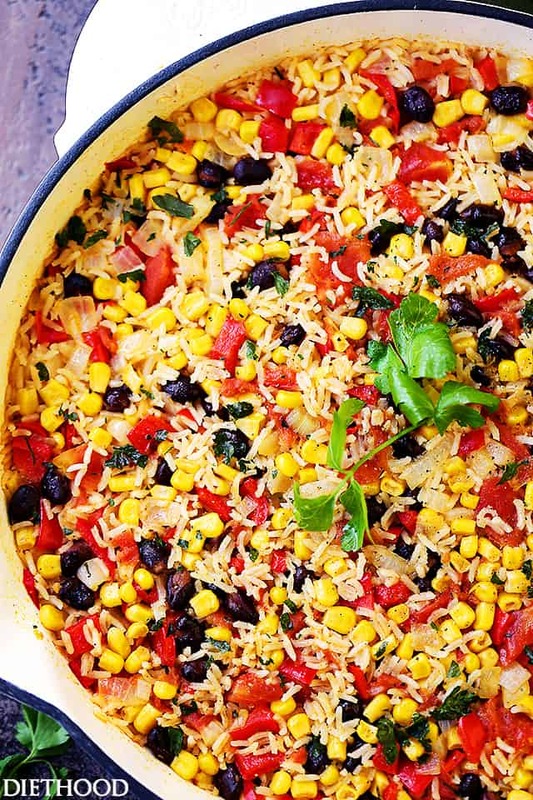 THIS Fiesta Rice being one of my too-many-things-all-in-one-pot, but-SO-GOOD-food. My world is currently revolving around super quick dinners. With my dad still in the hospital, I don’t have the time to slave around the kitchen for too long, or wax poetic about Pambazos or Carne Adobada, know whadda mean? BUT, quick, one pot rice that practically cooks itself? Oh yes, bring it on! 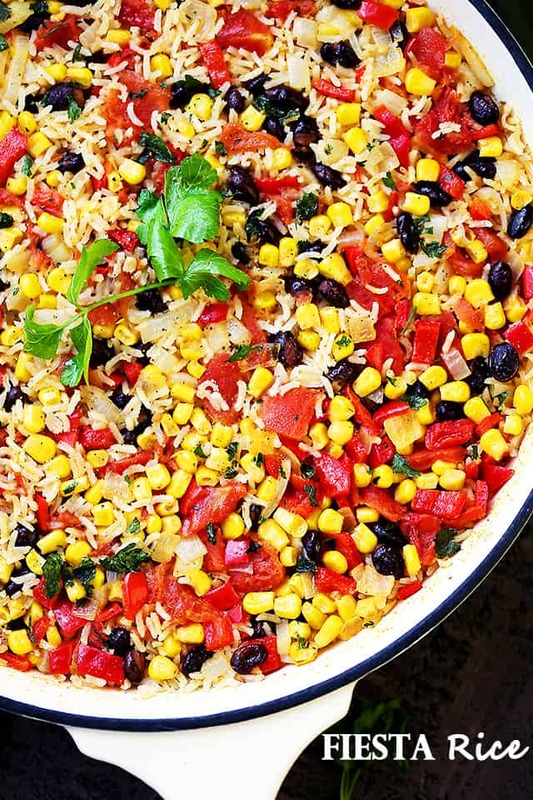 Well this is the best of both worlds: not only are we eating fluffy rice, we’re eating all this color! Filled to the brim with fiber, potassium, and antioxidants, it’s fun and fabulous. Trust me. Not that I ever need an excuse to eat beans and corn and tomatoes, BUT. If you tell me that eating all of that will bring me all those healthy goodies? I’ll probably house more than usual, to be honest. 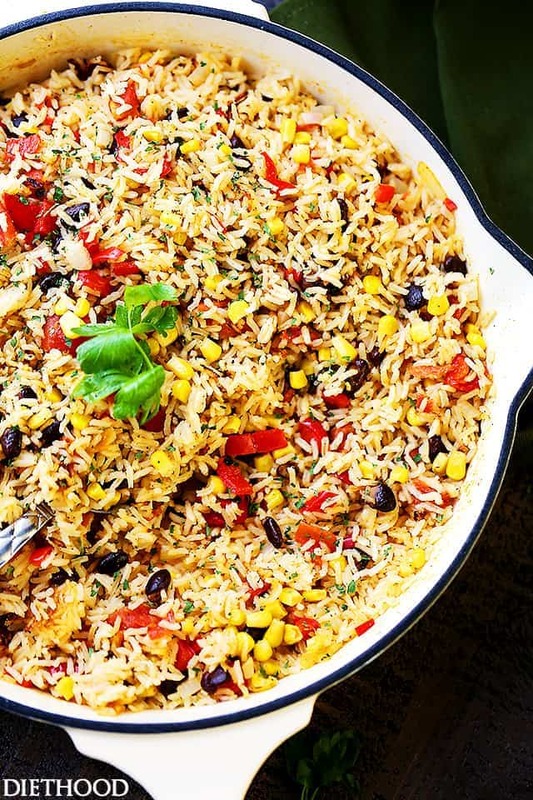 I’ve made a whole heck of a lot of side dishes in my blog life and I gotta say that this Fiesta Rice is probably one of the faves. The rice, the veg, the cumin and the tiny chopped and fried onions is just to die for. Maybe it’s because I am currently a bottomless pit – I need so much energy to keep me going while helping my parents AND running my own house – and I want to eat everything in sight, but the flavor combo here, while simple, it’s GOOD! 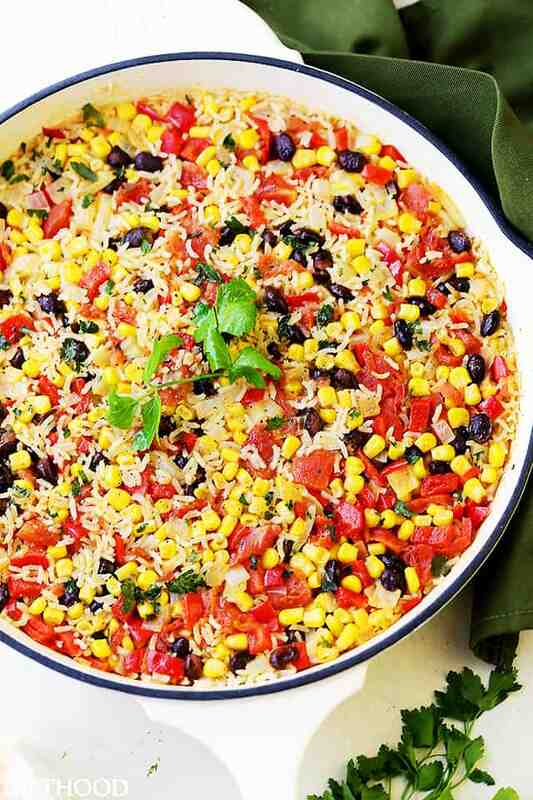 The rice is cooked in some brownish butter with onions and peppers, and then it takes a swim in flavorful broth with its canned buddies, tomatoes, corn and black beans. 15-minute-simmer later, this is your result. LOVE. Sidenote: If you are desperately trying to use up some of those 435 cans found in your pantry, this is YOUR recipe. You can also use frozen veg. Thaw it beforehand. 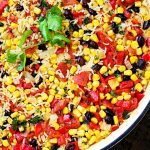 Fiesta Rice Recipe - Mexican inspired side dish recipe with fluffy, tender, flavorful rice and colorful veggies. Serve with Mexican food like, tacos or enchiladas, but it's just as good served with steak or chicken. 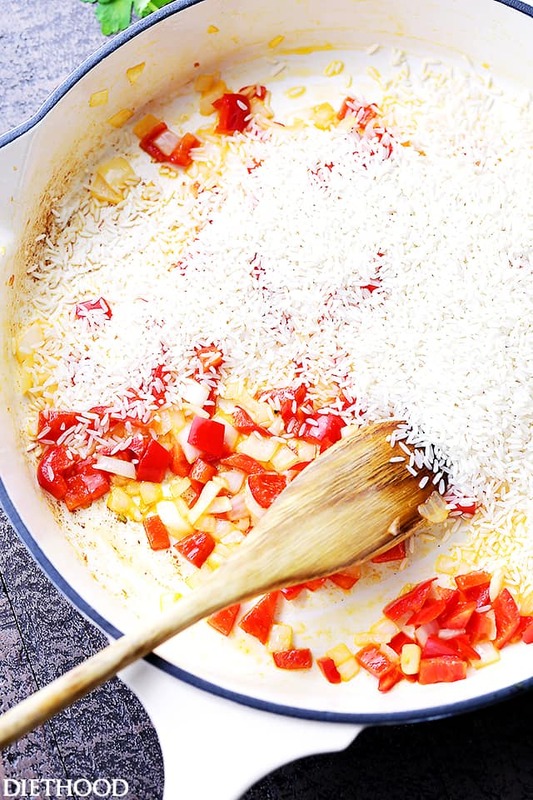 Add onions and red peppers; cook for 3 minutes. Add rice and cook, stirring often, for 2 minutes. 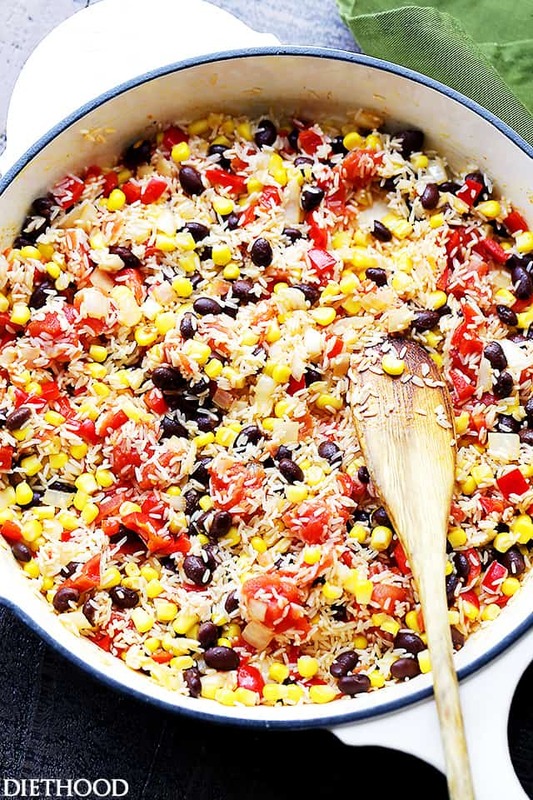 Stir in diced tomatoes with green chilies, black beans, and corn. Season with cumin, salt and fresh ground pepper. Stir in vegetable broth and bring to a boil. *Cover, reduce heat to low, and cook for 15 to 20 minutes, or until liquid is absorbed. Remove cover, fluff with fork and stir in cilantro and lime juice. NOTE: If you don't have a cover, top the skillet with aluminum foil and wrap it around. Sorry I’m a bit confused in recipe it says to rinse both the beans and corn then in question asked if it’s drained and it was answered no so do I open corn and drain it or just put it all in liquid included? Can’t wait to make this looks great! Hi! Yes, do drain and rinse the beans and corn, don’t drain the tomatoes. This is a great recipe. Very flavorful! Do you drain the canned vegetables? Or do you add them with all their liquid? It seems like that would be a lot of liquid since your also using 2 cups of broth. No, I don’t drain them out. Instead of canned coern, could I use fresh or frozen corn? Possibly the greatest complete protein vegan dish I’ve ever pointed a salivary gland at. Hi! Just came across this recipe and want to try it. I’m just learning to cook so excuse my silly question, but on step 4, “Add rice and cook, stirring often, for 2 minutes.” Am I adding the raw rice or pre-cooked rice? Hi! No problem! It’s always better to ask. So you add raw rice to the skillet. It will cook for about 20 minutes after you add in the liquid. Hello, I was wondering if I am going to a party at 3:30 and i make this now, will it still taste good heated up? Can you make ahead and freeze. how much to make if serving up to three hundred. How long can you hold it before serving??? Hi Doreen! I have never made this for 300 people, not even for 30, but I guess if this recipe serves 8, then you will have to multiply every ingredient by about 40 to get what you need for 300 servings. You can freeze cooked rice for up to 3 months. can you do it in a crockpot? Do you know what the actual number of servings this recipe serves? I need to feed about 40 to 50 people in February and would love to use this. I just need to adjust the amounts of the ingredients I buy to feed them. Hi Shelly! This can serve up to 8 people as a side dish. I’d make at least 5 times more for that many people. 😀 Hope this helps. Have a wonderful dinner party! Ugh, those late guests! Don’t they know we have dinner to serve?! ;-))) I am so happy to know that you enjoyed it, though. Thank YOU!! Have an awesome weekend! Yum! I am getting married in September and your website has been the source of my practicing my “wifey” skills for my fiancé. <3 so far he has loved all of them! I hope your dad recovers soon! And this looks delicious and super easy. Love it! I could just eat this for dinner and be perfectly happy! 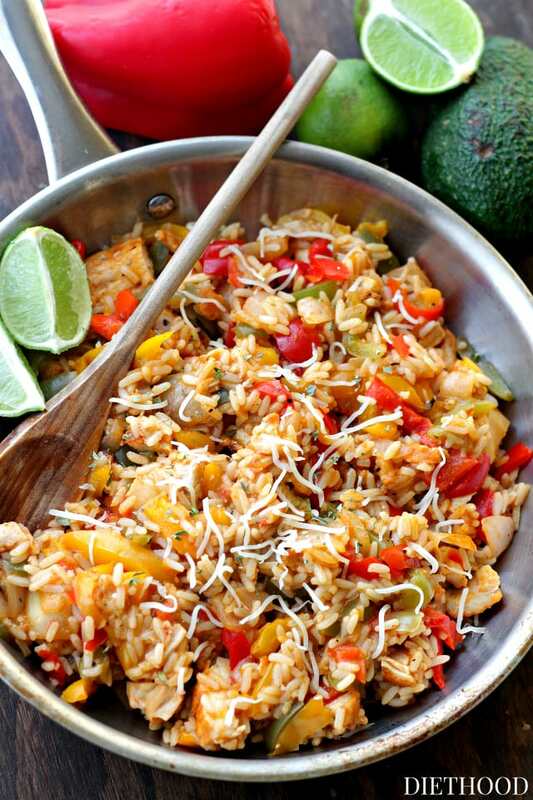 Such a yummy dish for Cinco de Mayo! Fiesta in my mouth! This rice has it ALL! This looks so dang amazing! I really want to try this ASAP! I love “loaded” ride – it’s so much tastier that way! This looks delicious! 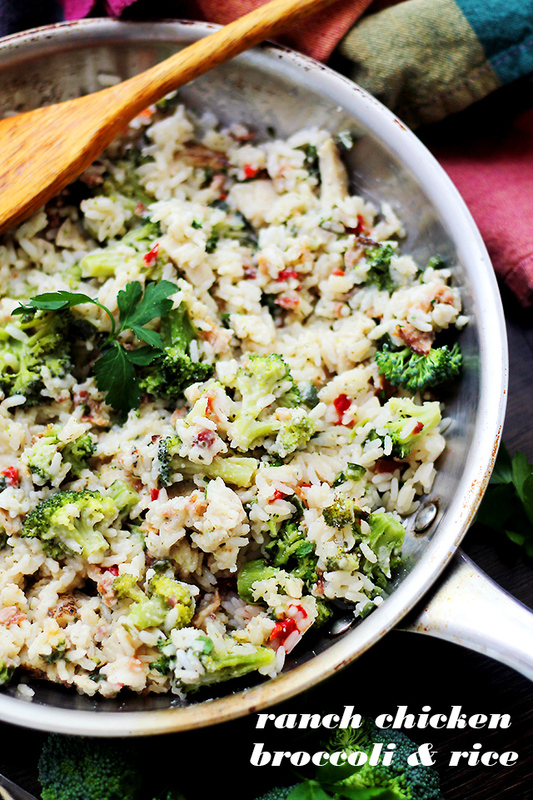 I love all the color in this rice dish! Happy Cinco De Mayo! I love how festive this is! The colors are just beautiful and all done in one pot? WINNER!! Oh my gosh! THANK YOU for those kind words!! ♥ Truly, it means a whole lot to me. Thank YOU! The Mexican rice calories is totally inaccurate at 61 cal per serving. 1/8th of 1.25c rice is over 100 by itself. This recipe is probably over or near 200 per serving. You are absolutely right! Thanks so much for letting me know! It’s 170 calories per serving. I wrote this recipe 3 years ago, and since then we’ve had to move to two other recipe cards – during that transfer, some of the nutritional analysis either didn’t go through, or the information that did get through is incorrect. I have gone through most of them, but clearly I missed this one. Again, thank you very much for letting me know.